Complete coverage for the different Office 365 applications and workloads provides insight into how the applications are used, consumed and adopted within your Organization. Once you enable reporting for Office 365, leverage the Role-based Administration and Control (RBAC) within Exoprise CloudReady for your entire operations staff. They get a complete 360-degree, read-only view into your Office 365 operations and it doesn’t require giving out administrative access. CloudReady leverages discrete OAuth authorizations for different data-sets within Office 365. You have complete control over what type of data to retrieve and who to present it to. 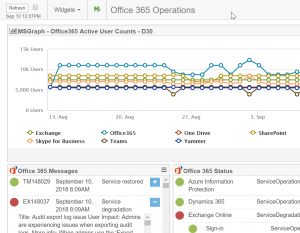 Office 365 reporting, usage, activity and audit is a few clicks away. CloudReady leverages open APIs to pull Office 365 data in real-time and historically — the same APIs that are available to customers. With CloudReady, there are no databases to maintain or queries to upgrade as Microsoft adds additional features. And the data is always available for export. 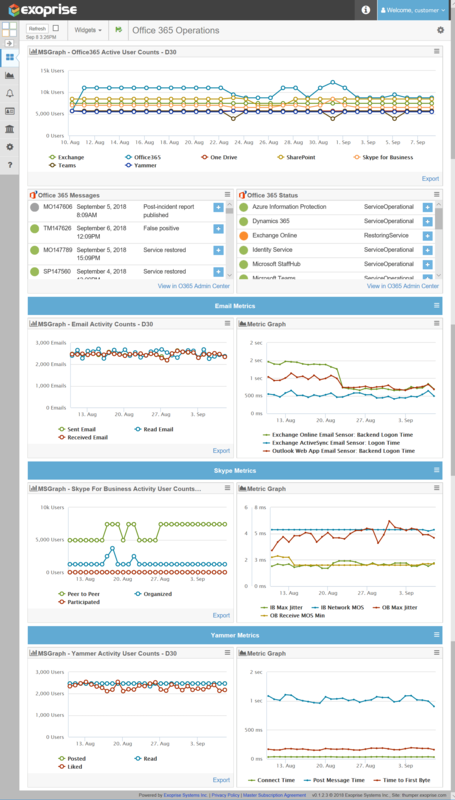 Exoprise offers the most comprehensive active monitoring for ALL of Office 365 as well support for the rest of your mission-critical SaaS and custom web applications. Now, with built-in reporting, you have one tool and one place to go for comprehensive visibility and insight. CloudReady integrates the per-tenant Office 365 status and incident messages into its dashboards and consoles. Build operational dashboards around SharePoint, Skype for Business, Microsoft Teams, Exchange Online, OneDrive and more. CloudReady supplies 100’s of reports out of the box and the dashboards are customizable via roles. Build dashboards for the teams within your organization. Save money by ensuring that your are optimizing your usage of purchased Office 365 licenses with activity and usage monitoring. Recover expenses when SLA thresholds are violated. With the power of Exoprise CloudReady for end-to-end network and cloud monitoring, you have one place to go for a complete real-time service and support view into how your Office 365 deployment is performing and being utilized. End-to-end SharePoint Online monitoring from your place or ours. High-level actions, low-level metrics. Monitor Exchange Online, Outlook Web App (OWA), MAPI, ActiveSync. Pick any protocol. Proactive monitoring for Skype & Microsoft Teams. Automate the ACTUAL Skype & Teams clients. Add the authorization to enable CloudReady to read your Office 365 Service Health and Incident Messages. Filter and customize the views by application and build a complete operational view of any app, any workload. Here’s a list of reports that are available within CloudReady or that we are working on to fully realize. You’ll get notifications of new reports as they become available and the default Reporting layout will be updated dynamically.